Should You Demolish Your Home? | Abbotts' Construction Services, Inc.
Should You Demolish Your Home? When you need major renovations to your home, you may also want to consider the benefits of simply tearing down your property and rebuilding it. Depending on your situation, a complete demolition may be both more affordable and get you closer to what you want for your home. Here are six questions to ask yourself before you make a decision. 1. Is Your Home Currently Unsafe? If your home is currently unsafe and uninhabitable, you will likely need a lot of updates and upgrades. Large plumbing and electrical issues may cost more to repair than to simply put a new system in. Many structural problems can be more costly to remediate than to tear down and start over. Homes that have been through hurricanes, tornadoes, earthquakes, and flooding are often damaged so significantly that the home would cost more to repair than to replace entirely. Rebuilding tends to add value to your home long-term because it resets the clock. If you have a home that was built in 1963, appraisers will always judge its value as a 1963 home. 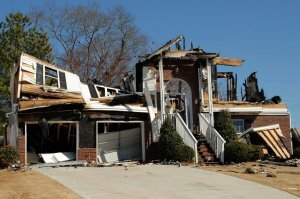 If you rebuild it entirely, you will have a brand-new home that will be able to retain its value better moving forward. 3. Do You Want to Make Significant Layout Changes? The more dramatically you want to alter your home, the more likely you should tear down and rebuild. If you want to change the layout and make additions to your home, you have to do a lot of the work for rebuilding a home anyway. You will have to reroute pipes and electricity, upgrade HVAC systems, and even potentially reinforce or replace the foundation and roof. 4. Do You Want to Make Changes in the Future? Often a homeowner will develop a sequence of upgrades they want to make. The homeowner may want to open up the living room first, add a second floor later, and then add another bathroom. If you want to make changes in the future, the changes may be significantly less costly (and disruptive) to get them all done at once. Compare the full cost of each individual upgrade to the cost of tearing down your house and building a new house. 5. What Are Your Zoning Laws? You may run into some zoning issues with remodels and demolitions. While you are generally allowed to tear down and rebuild your home as you desire, you might find that you can’t build the home you want. Zoning laws could put restrictions on the size of your home or whether you can build more than two stories. Before you make the decision to rebuild a home, make sure you can implement your new plans. 6. How Valuable Is Your Land? Of course, the choice is not always between demolish or renovate. You may also want to consider the value of your land versus the value of your home. If your land is not worth much after the teardown is complete, purchasing a new home altogether might be a good alternative. Rebuilding or renovating is generally best when you have land that is valuable, such as an old home in a now expensive and expanding market. Ultimately, demolishing your home will come down to money and convenience. If you find that the quotes are higher for a renovation than a rebuild, rebuilding may be smarter. Likewise, if you want to change a lot about your house, rebuilding is an investment that will pay off for some time to come. If you decide to demolish your home, contact Abbotts’ Construction Services, Inc., today for a quote.